Who is the greatest cricketer of all time? In a comprehensive new series, Pitch International asks the question that all cricket fans have spent hours debating. From the batting genius of Don Bradman and Viv Richards, to the bowling mastery of Shane Warne and Michael Holding, not forgetting the all-round abilities of Ian Botham and Kapil Dev. This is a comprehensive guide to the stars who have entertained us for nearly a century. In a unique new series we profile the 25 greatest cricketers of all time, featuring insightful interviews with legends both past and present, as well as the teammates, coaches, friends and family who helped them towards greatness. Each programme pays homage to these legendary sportsmen by highlighting the extraordinary talents of these masterful cricketers, which is complemented by the very best archive action. 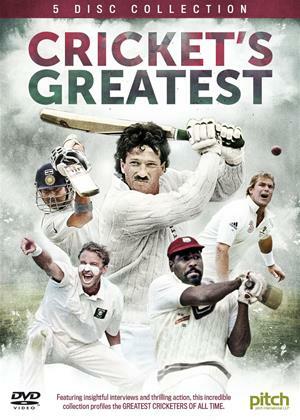 Quite simply, this is a must-have for all cricket fans.